Doshin the Giant is a simulation game developed by Param and released as a launch title for the Nintendo 64DD in December 1999. The game would later see an update re-release on the Nintendo GameCube in 2002, which was also released in Europe. While there were talks between Param and Nintendo of America to release the Nintendo 64DD version in North America, there was no such release. 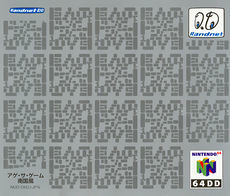 An expansion and spin-off title was later released for Nintendo 64DD, titled Kyojin no Doshin Kaihō Sensen Chibikko Chikko Daishūgō. Doshin the Giant is set on an island in the middle of the ocean named Barudo. The game opens with a narrator explaining that the islanders have told a legend for generations: that one day, a giant will appear out of the ocean at sunrise. On one morning, Doshin appears out of the water and heads to the island. Game creator Kazutoshi Iida has said that, at the start of his game development career, he set a personal rule that he would create three games; following Aquanaut's Holiday and Tail of the Sun, Doshin the Giant was the final game. The game was developed for Nintendo 64DD as Iida thought the game would require a higher amount of storage space and rewriteable memory than was allowed by the standard Game Paks of the time. EU: September 20, 2002 An updated re-release of the game, featuring some gameplay changes and extra content. ↑ Doshin to the US?. IGN (August 27, 1999). Retrieved May 16, 2017. ↑ toco toco ep. 52: Kazutoshi Iida, Game Creator. toco toco tv (YouTube; May 15, 2017). Retrieved May 16, 2017. ↑ Iida the Giant. IGN (September 30, 1999). Retrieved May 16, 2017. This page was last edited on 20 May 2017, at 17:03.